Have you found an online vendor selling Admiral Rodney HMS Royal Oak ? Très bonne surprise que ce rhum venu des îles de sainte Lucie! Très bon équilibre entre les rhums antillais et ceux d’amériques Latines. Enjoyed a bottle of Admiral Rodney HMS Royal Oak while in London. Bottle and label design are very nice and high end. Golden color. Prunes, grapes, vanilla and oak to your nose and palate. Whisky like burn at the end. If you are a whisky lover, then add 2 points to the score. Unfortunately I haven't currently got a bottle of the "standard" Adm Rodney XO to compare it to, and memory is a little hazy!! It comes across as having a lot more soft oak.However I don't quite understand the pricing structure. The standard Admiral Rodney is a 12yo, and this one is a 7yo yet more expensive. My personal preference is a dry rum (no sugar added), that is warm and spicy with a good gentle burn from the alcohol and with a heavy dose of oak. Not so much that it masks flavours, and not sweet sherry oak. A rum with a good length and that is unctuous. This rum has it all. It is to me really superb....I just now want to try it against the normal Admiral Rodney to see what the difference really is!!! 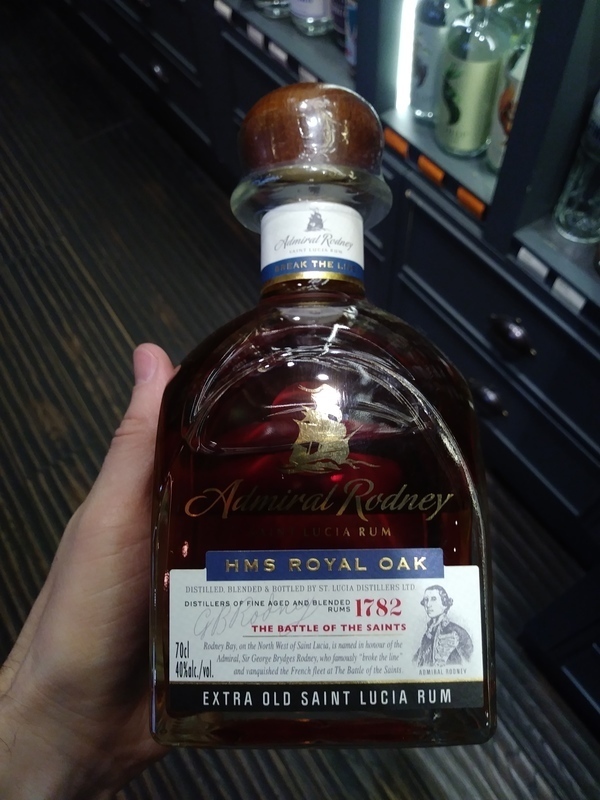 St. Lucia Distillers introduce the Admiral Rodney Rum range, a selection of extra old Saint Lucian rum from Coffey still distillates that have been aged in American white oak Bourbon casks. HMS Royal Oak has a blend of rums matured for 7 to 12 years. The new range honours the naval victory of Admiral George Rodney at Battle of the Saints in 1782 against the French, and each rum is named after ships that distinguished themselves in the battle. Prune, grapes and spices initially with tobacco, chocolate, caramel and vanilla notes underneath.